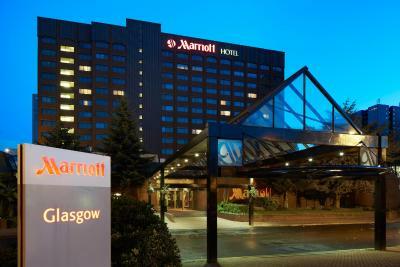 Lock in a great price for Glasgow Marriott Hotel – rated 8.4 by recent guests! Breakfast was lovely although very busy and we had to wait for people to leave before entering but the staff dealing with us were really lovely. Loved the special touch of a handwritten birthday card from staff, balloons and fizz. 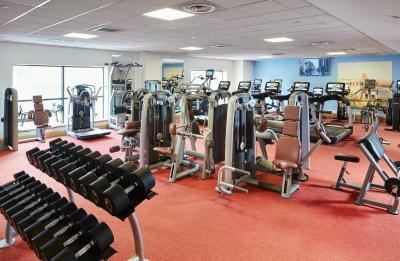 Gym facilities. Reception staff very professional and welcoming. Rooms where spaceious and tidy. Bar and restaurant where nice and the staff where lovely to deal with. Very friendly staff, good facilities and within walking distance to the city. The beds were very comfortable and the room was clean. Breakfast was also very nice. We had a very pleasant stay at the Marriott and would recommend the hotel. The room was very comfortable and good value. Room, was big enough and had everything needed, Breakfast was amazing. It was short stay I didn’t had enough time to explore area. 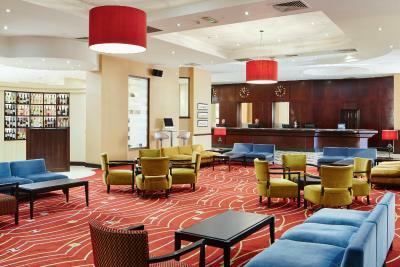 Glasgow Marriott Hotel This rating is a reflection of how the property compares to the industry standard when it comes to price, facilities and services available. It's based on a self-evaluation by the property. Use this rating to help choose your stay! 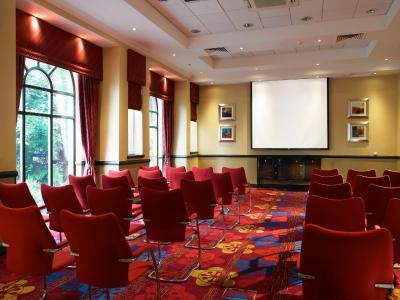 One of our top picks in Glasgow.This 4-star hotel is in Glasgow center, just a short walk from the SECC (Scottish Exhibition and Conference Center) and the shops of Buchanan Street. It has air-conditioned rooms, an indoor pool, steam room, sauna and gym. Free Wi-Fi is available in public areas. This modern hotel offers large rooms each with luxury bedding, a work desk, and a large flat-screen TV with pay movies. The Glasgow Marriott Hotel is less than a mile from the shops of Buchanan Street and the bars and restaurants surrounding Princes Square. Anderston Rail Station is just 3 minutes’ walk away. 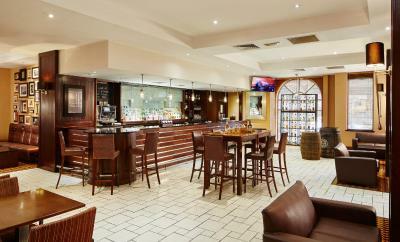 The Glasgow Marriott has a health and beauty spa offering a range of treatments, and a well-equipped fitness center. Guests have free use of modern cardio equipment, weights, and a sauna. The international-style Cast Iron Grill restaurant offers international cuisine and fine wine. The Brew Bar Lounge is a more casual cafe/bar offering specialty cocktails, sandwiches and hot snacks. 24-hour room service is also available. Central Glasgow is a great choice for travelers interested in clothes shopping, shopping and nightlife. 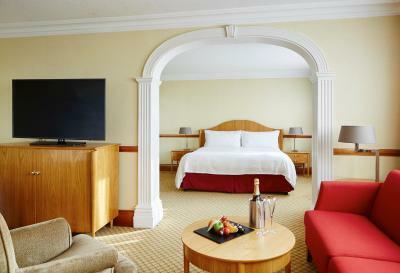 When would you like to stay at Glasgow Marriott Hotel? The spacious executive king bed room has complimentary tea/coffee-making facilities, Internet for a fee, work desk and hairdryer. The private bathroom includes a shower/bathtub combination and complimentary toiletries. 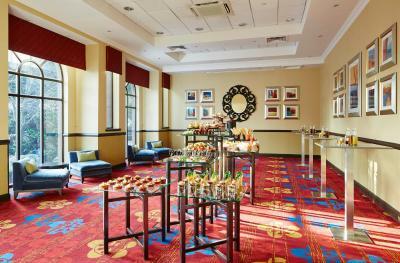 The room also provides access to the Executive Lounge where you can enjoy complimentary beverages and canapés. Please note on Friday and Saturday, there are no canapés or alcoholic beverages available. Private parking is available on site (reservation is not needed) and costs GBP 10 per day. This guest room either has a king bed or two double beds. 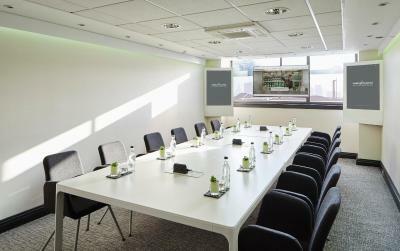 The room features a LCD TV, complimentary tea/coffee-making facilities, work desk and hairdryer. This room can only accommodate 4 adults when two double beds have been guaranteed. The private bathroom includes a shower/bathtub combination and complimentary toiletries. Internet is available for a fee. Spacious room features newspapers delivered upon request. The spacious deluxe king bedded room has complimentary tea/coffee-making facilities, Internet for a fee, work desk and hairdryer. The private bathroom includes a shower/bathtub combination and complimentary toiletries. This double room has air conditioning, cable TV and a sitting area. Set in a bustling, cosmopolitan city with a renowned business centre and prestigious shopping, the four star Glasgow Marriott Hotel puts you in the heart of it all. Our luxury Glasgow hotel is a five-minute stroll to nightlife, the Scottish Exhibition and Conference Centre and one of the best shopping areas outside London. 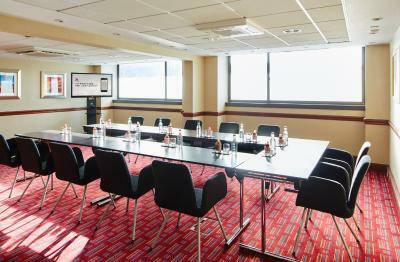 Perfect for business or leisure, our four star hotel in Glasgow, Scotland, offers air-conditioned rooms, wireless Internet throughout the hotel and 12 conference rooms. Hotel surroundings – This neighborhood is a great choice for travelers interested in clothes shopping, shopping and nightlife – Check location Great location - show map Guests loved walking around the neighborhood! 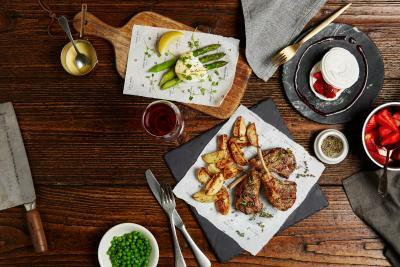 House Rules Glasgow Marriott Hotel takes special requests – add in the next step! Glasgow Marriott Hotel accepts these cards and reserves the right to temporarily hold an amount prior to arrival. Please note that the card used to make the booking must be available on check-in. When booking a breakfast-included rate, the room includes breakfast for 2 adults and 2 children under 12 years of age. The breakfast was lovely. Easy access to restaurant. Very clean and comfortable.Good location. Good clean indoor pool.Family friendly. The shower in the room makes so much noice it had a problem with it, toilets in the lobby were dirty one of the men toilet didnt have any tissue rolls in itthe check in time is too late, i travelled from manchester and was there at 9am and i been told to wait till 3pm as there aint any rooms available or pay £20 for early check in. If there wasnt any rooms how come £20 would give me a room??? There is no fridge in the room, and no complimentary water. Nothing particular as all was far and staff very extremely polite ! I liked the variety of food selection and enjoyed very much the swimming experience! Wish that I booked some swimming lessons . Pool was small and full of kids, I was woke up early hours with noise, staff where not aware of the noise. ROOM AND STAFF Great ! No refrigerator on rooms..You have to request first if you want a refrigerator then they will produce one.. Thats need change... Toilet is slow needs change....Needs upgrade in the rooms..
Bath in room was very dirty and even when asked for it to be cleaned it was still dirty! A/C in room just blew out warm air and room was far too hot. Awful nights sleep. Would not recommend.